(URBANDALE) – Gov.-elect Terry Branstad today named his first department official, announcing David Roederer to head the Iowa Department of Management upon assuming office on Jan. 14, 2011. Roederer, who is spearheading the governor-elect’s transition team, is currently the executive director of the Iowa Chamber Alliance. Roederer looks forward to serving the administration in his new position. Reuters reporters and editors had Arizona Senator John McCain in for a “roundtable” yesterday. Here’s the story. McCain last’s trip to the state, about two years ago, didn’t go well according to many accounts of that encounter with The Des Moines Register’s editorial board. McCain lost Iowa in the 2008 General Election. McCain finished fourth in Iowa’s Caucuses on January 3, 2008. McCain finished fifth in the 2000 Iowa Caucuses, behind Alan Keyes and Gary Bauer. In 1994, about 300,000 Iowans cast ballots in the Republican Primary. That was the year Republican Congressman Fred Grandy challenged then-Governor Terry Branstad. There was lots of cross-over voting, as Democrats became Republicans for a day to vote against Branstad in June rather than wait ’til November. Grandy came within four percentage points of Branstad in that primary. In 1998, Branstad was not seeking reelection and there were three Republicans running for governor. The contest was among Jim Lightfoot, Paul Pate and David Oman and Lightfoot won the G.O.P.’s 1998 nomination for governor. About 162,000 voters cast ballots in that Republican Primary. In 1998, Tom Vilsack and Mark McCormick competed in the Democratic Primary for their party’s gubernatorial nomination. About 115,000 Democrats cast ballots for that contest, which Vilsack won en route to winning the governorship that fall. In 2002, there were three Republicans seeking the G.O.P.’s nomination for governor. About 199,000 Republicans voted in that Primary which Doug Gross won with 35.88 percent of the vote. Steve Sukup was second with 32.37 percent and Bob Vander Plaats was third with 31.66 percent. In 2006, there were three Democrats running for governor. About 148,000 Democrats voted in that contest among Chet Culver, Mike Blouin and Ed Fallon. Culver won the Primary — and the General Election. On January 3, 2008, Iowa Republicans held Caucuses. Below are the numbers that were released by the party that night (the numbers are the raw straw poll vote total for each candidate). For comparison purposes, consider that Vander Plaats’s 2010 campaign has plugged into that Huckabee network and Branstad has many Romney-connected folks working on his 2010 campaign. Finally, at the close of business on Friday, Iowa Republicans had cast about 20,000 absentee ballots for today’s Primary compared to about 7,000 absentee ballots from Democrats. Congressman Dave Loebsack (D-Mt Vernon, Iowa) was a long-time political science professor at Cornell College before he was elected to congress in 2006. A Loebsack aide tells James Q. Lynch of The Cedar Rapids Gazette that Loebsack isn’t interested in becoming the school’s next president. The Progressive Change Campaign Committee will spend thousands of dollars this week on an online ad campaign in the states of at least 10 senators who should be for the public option but have refused to issue a statement so far, reaching at least 1 million people online. First up: Sen. Tom Harkin of Iowa — and we’ll soon be naming more. Jon Stewart lampooned Harkin last week for previously saying, “I’d say right now we have well over 55 votes for a public option, but we need 60” — while now shrugging his shoulders and saying not even 50 exist. Harkin also claimed on MSNBC that nobody has fought harder for the public option than him. I’ve been a longtime Harkin fan, but at this point, that claim is laughable. I can name at least 30 senators who have fought harder than Harkin, with more likely to come. Republican gubernatorial candidate Bob Vander Plaats wins one aspect of the race with competitors former Governor Terry Branstad and Representative Rod Roberts. Vander Plaats was first to file his nomination petitions, a few hours after the period for filing opened. Former Governor Terry Branstad’s kick-off event for his fifth campaign for governor began shortly before 10 o’clock this morning at the State Historical Building in Des Moines. Here’s the Radio Iowa story about the event and if you click on that link, you will find an mp3 of the entire Branstad speech there. What follows below is a “live blog” of the event. State Representative Jeff Kaufmann, a Republican from Wilton, took to the microphone about seven minutes before 10 o’clock. Biden said he was a bit late to the stage tonight because he’d been calling Democrats in the senate who he’d lobbied to vote tonight. “I was on the phone and calling those senators who I was able to help change their minds on this vote. That’s why I was late. They did the right thing. Tonight, tonight we defied the pundits. We were told, every talk show you listen to, including the main stream media… health care was dead. Well, it’s alive and well and it will pass,” Biden said. The crowd was on its feet, cheering through this passage. Biden told the crowd he’d been monitoring the senate vote as he flew to Iowa on Air Force II. 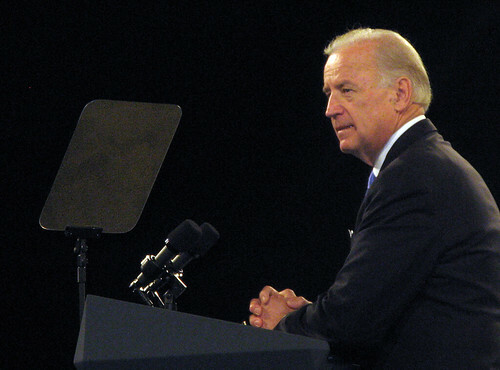 Here’s the full live blog, with Biden’s comments at the end. According to the screen hanging in the northwest corner of HyVee Hall in Des Moines, the Iowa Democratic Party’s 2009 Jefferson-Jackson Day Dinner is to start in 47 seconds. I doubt that, as people are milling about, basically in the dark, as they search for their seats at the round tables. The room is set up in a sort of theatre-in-the-round, with the stage in the center of the room the only thing that is bathed in light. Party officials say they’ve sold “nearly 1500” tickets. 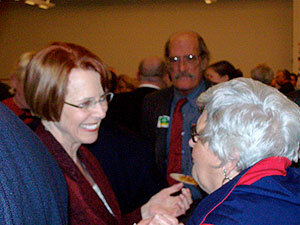 Roxanne Conlin, the US Senate candidate, rented a reception room downstairs for supporters to gather before the dinner. She spoke to the crowd shortly after six o’clock. “At this moment I have been a candidate for one week and six days and really, so far, so good,” Conlin said, laughing, as the crowd applauded. That’s the date of the first Republican gubernatorial candidate forum in which the new entrant in the competition — former Governor Terry Branstad — will participate. It’s the night of the fall fundraiser for the Republican Party of Iowa. It’s also the night “T-PAW” — Minnesota Governor Tim Pawlenty — will make his first public appearance in Iowa for the 2012 cycle. Pawlenty was last here in August, 2008, to speak at a Latham campaign event which was seen as one of Pawlenty’s public auditions for the role of John McCain’s running mate. Pawlenty memorably used a tire gauge as a prop. Pawlenty also told an “Olie and Lena” joke at the Latham event in ’08, so those of you planning to attend the 11-07-09 event, prepare yourself for at least one joke about a fictional Norwegian couple’s naivete.